• and fiestas, celebrations, and art, including mural and graffiti art. Tatum provides a brief overview of Mexican American social history, paying particular attention to changing cultural perspectives over the past 150 years and the evolution of el movimiento chicano. He also introduces theories of popular culture and makes them accessible to students, enabling them to better understand the material covered in the text. No other book offers such a wide-ranging introduction to these cultural expressions of Mexican Americans today. 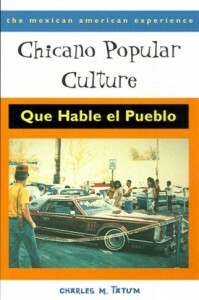 Chicano Popular Culture invites readers to share the excitement of these vital arts and, through them, to learn more about the uniqueness of America’s fastest-growing minority. 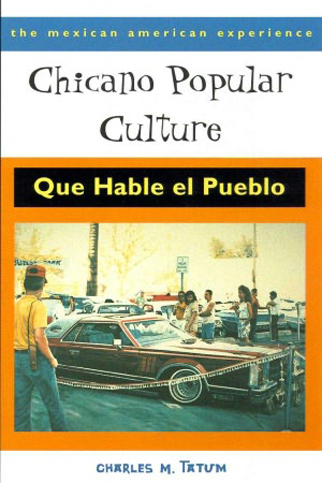 Chicano Popular Culture and Mexican Americans and Health are the first volumes in the series The Mexican American Experience, a cluster of modular texts designed to provide greater flexibility in undergraduate education. Each book deals with a single topic concerning the Mexican American population. Instructors can create a semester-length course from any combination of volumes, or may choose to use one or two volumes to complement other texts. This entry was posted in Recent IAS Books. Bookmark the permalink.